The "War on Drugs" hasn't reduced the percentage of the population addicted to drugs at all, no matter how much is spent. Which means ending the drug war should have a negligible impact on the number of addicts as well, but it would save us money and help people instead of ruining their lives forever. The LA Times recently reported that housing a prisoner for a year in California now costs more than a year at Harvard. Think about that for a second. That’s over $75,000 per year, per prisoner. That is a lot of money. While $75,000 definitely does seem expensive to me, as I’m sure it does to you, the truth is that it would be much easier for me to swallow this sort of expense if the people in prison were all violent criminals or major thieves. There’s absolutely no part of me that wants to be “easy” on crimes like those. Any crime with a victim should be punished to the fullest extent of the law. But who is the victim when someone breaks their leg in an accident, ends up hooked on highly addictive opiate prescription pain medications, and then ends up on heroin once the prescriptions run out? If they didn’t steal anything or hurt anybody, the only victim in that situation is the addict. Why would we jail the victim? Especially for $75,000 per year?! We can send them to addiction treatment for as little as $6000! It simply doesn’t make sense to me on any level. When we send non-violent drug offenders to prison, they go in as addicts or as people who made a very costly mistake, but they often come out as real criminals. They learn from the other inmates and then return to society more dangerous than before. Plus, returning to society with a criminal record makes getting a job really tough, and sometimes nearly impossible, forcing many of these people into more criminal activity. In the top poll, the majority of people said they would turn their child in if they committed crimes where there was a victim. But the bottom poll, almost nobody said they'd turn in their child for the use of illegal drugs. This tells me that we all know, deep down, that criminalizing drugs is a bad idea. If we wouldn't do it to our children, why would we do it to someone else's? By treating drug use as a public-health issue, rather than a criminal issue, we could easily send these people to rehab for a tiny fraction of the cost, and then return them back to the free world without a criminal record, allowing them to become gainfully employed and contribute back to society once more. And the truth is, I believe most of us intrinsically know the war on drugs doesn’t work. I did a couple of informal polls on my Twitter account a while back and asked two basic questions. Look at how different the answers are. If it were your kid who was addicted to illicit drugs, it’s doubtful you’d call the police on them. Because deep down you know that wouldn’t be very helpful. If it’s true for your child, it’s true for most people. Besides, this is already being done elsewhere in the world. In Portugal, for example, they decriminalized all illicit drugs in 2001. 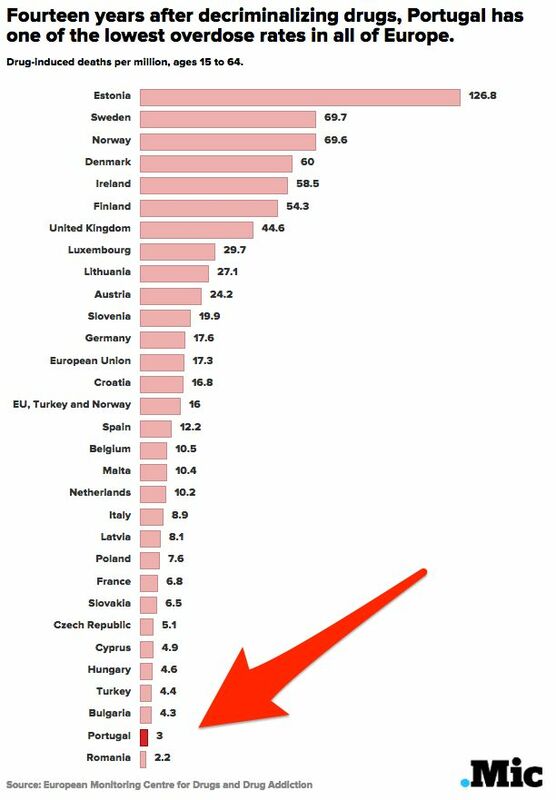 After 15 years, the nation has less than half the number of addicts it had before, and now boasts the second-lowest drug-overdose rate in all of Europe. Not only would decriminalization reduce costs as I outlined above, but taxpayers would save billions every year at the enforcement level, as well, such as with the Drug Enforcement Agency (DEA), the Coast Guard, and every other enforcement level from city cops all the way up to the feds. Ultimately, I believe that as long as any product or service has a market, legal prohibition against that product or service cannot work. It never has worked, as pointed out in the July 13, 1989, Wall Street Journal. It didn’t work when it was alcohol about a century ago, it doesn’t work with gambling, and it doesn’t work now with drugs. People who want those things are going to get them. All prohibition does is drive up prices and introduce violent and property crime surrounding it. This is why prohibition of alcohol didn't work, and why prohibition of illicit drugs can't work. Prohibition makes things worse, not better. If you want people to stop doing drugs, you do it the same way we stopped so many people from smoking cigarettes: Education, and taxes to fund the education. In other words, you have to reduce/remove the market for the drugs by making people not want to do them anymore. And this is why I believe that we will eventually – maybe not in my lifetime – need to look at outright legalization of all illicit drugs. It will cut back on crime from top to bottom related to the black market we have today. 2) Since the United States makes up nearly the entire market for drugs manufactured and distributed by cartels in Mexico, Central America and South America, I believe we, as a nation, have to take some responsibility for what’s happening today in those nations to our south. As the American Ambassador to Mexico, Tony Garza, said in 2008: “Mexico would not be the center of cartel activity or be experiencing this level of violence, were the United States not the largest consumer of illicit drugs...” It’s American money that makes drug cartels so powerful that they often control entire governments. It’s American money that pays off police south of our border to look the other way when a bunch of students “go missing.” It’s American money that makes things so miserable for people all over Mexico, Central and South America. It’s American money that makes people’s homes so dangerous in, for example, Honduras, that they immigrate to the USA (often illegally). Because of the cartels there, Honduras has a murder rate of 74.6 out of every 100,000 residents. For comparison, it’s 4.5 per 100,000 in the USA. I believe we have a responsibility for causing the crime and misery we’re causing to those people, and legalizing illicit drugs would bankrupt the cartels and allow the citizens there to take back control of their own governments and their lives. Since Portugal decriminalized all illicit drugs, their overdose rate has dropped to the second-lowest in all of Europe. 3) Legalizing drugs would create a new and needed tax-revenue stream that we could use to treat addicts (as opposed to jailing them) and to educate people about the dangers of the very same drugs, just as we’ve done so successfully with tobacco products. 4) If drugs were legalized, that means they could be regulated by the government, which would make them much safer. Let me explain: Drug overdoses are rampant in our country right now, and the main reason most people overdose on, for example, heroin, isn’t because they just decide to do more than usual one day. Usually, overdoses happen when a drug user is used to using heroin that’s, for example, 25% pure, but then gets a batch that’s 50% pure without knowing it. They use the same amount but get double the dosage and either end up in the hospital or the morgue. If drugs were legalized, there would be regulations in place to make sure potency levels were consistent and other contaminants were eliminated. It would prevent accidental overdoses almost completely, saving literally thousands of lives every year here in the USA. 5) I know it’s hard to imagine, but the final benefit is that it would create legitimate jobs here in our country, from farmers growing the coca and poppy plants, to processing and shipping, all the way down to retail stores selling them. The "War On Drugs" officially began in 1971. This is not a coincidence. We now have more people in prison than any other country on earth both by outright number and percentage of population. "Land of the free"? Not so much. We have 5% of the world's population, and 25% of the world's prisoners. It’ll likely take decades to get there, if we ever do, but decriminalizing drugs is the correct first step. People are already drug addicts, often starting with legitimate prescription medications (which are often the true “gateway drugs”). Ask yourself this: Would you try heroin if it were legal? My bet is that you’re shaking your head no. I wouldn’t, either. I believe it’s possible that the use of hard drugs like heroin and methamphetamines could actually be reduced by legalizing them, simply because we always want what we’re not allowed to have, and allowing them will eliminate some of the appeal to trying them in the first place.